Baptism (Greek: βαπτισμω, baptismō ; baptism) or (Latin: baptismus), as seen in Vulgate in Colossians 2:12 . The verb from which the noun is derived, βαπτίζω, (baptizō, to baptize) is translated by some scholars as "immerse", "dive" but other scholars argue that this meaning is not as accurate or common meaning, but a secondary or derivative. Other possible meanings for the term are "washing", "pour", "cover" or "stain" as used in New Testament and Septuagint. In the Septuagint version of Old Testament the term baptizō is used twice: in 2Kings 5:14 meaning "cleaning" and in Isaiah 21:4 where its meaning is unclear. Other forms of presentation of this noun is βαπτισμα (baptisma) and βαπτισμός (baptismós). The symbols and meaning of Baptism sometimes is forgotten by many Christians. The bible says in Roman 6:4 “So we were buried with him through our baptism into his death, in order that just as Christ was raised up from the dead through the glory of the Father, so we also should walk in a newness of life.” Our baptism into the water represents Jesus burial and us coming out of the water represents the resurrection of Christ and a new start or relationship with Christ. . Some Christian churches have different symbols for baptism that other may not have. The Catholic church commonly anoints oil (as seen in the image) in their baptism to symbolize the coming of the baptized and the holy spirit. Many churches have left this old practice of using oil, but some include it in their rituals. This practice anointment of oil comes from 1 Samuel 16:13 stating “So Samuel took the horn of oil and anointed him in the presence of his brothers, and from that day on the Spirit of the LORD came powerfully upon David. Samuel then went to Ramah.” God commanded in this story that new kings would be anointed with oil to receive the holy spirit. There are many different practices and symbols of baptism in Christianity. .
Baptism is undeniably one of the most memorable and important steps you make in your life with Christ. It represents a new and fresh start with God. One major question asked throughout history is being baptized necessary for you to have eternal life? The bible states some verses that may indicate baptism is necessary, for example Mark 16:16 has been used to teach baptism importance which states “He who believes and is baptized will be saved; but he who does not believe will be condemned”. Since this quote states that he who is baptized is saved, may believe that this confirms that baptism is necessary for salvation. 1 Peter 3:21 states “ and this water symbolizes baptism that now saves you also—not the removal of dirt from the body but the pledge of a clear conscience toward God. It saves you by the resurrection of Jesus Christ”. Many jump to conclusion and talk about the “baptism that now saves you” but the quote when read by itself is misleading. .
Baptism is important if you want to have a relationship with God for the rest of your life, but it does not give you an automatic ticket into heaven (as seen in the image). The bible clearly states that you are saved through faith rather than good works. Ephesians 2:8-9 states “For it is by grace you have been saved, through faith—and this is not from yourselves, it is the gift of God not by works, so that no one can boast.” and Roman 10:9 states “If you declare with your mouth, Jesus is Lord, and believe in your heart that God raised him from the dead, you will be saved.” Unlike the quotes about baptism saving you these quotes clearly states that faith is more important than works. Although baptism is not totally necessary to be saved, it is important in our relationship with God. . Many believe that the origin of Baptism started from Christianity or the time Jesus first got baptized. This is not true, Jews practiced had a similar practice not called baptism but many of the rituals were the same. This is described in the Old Testament Leviticus 16:4 stating “He is to put on the sacred linen tunic, with linen undergarments next to his body; he is to tie the linen sash around him and put on the linen turban. These are sacred garments; so he must bathe himself with water before he puts them on.” . However it is not clear that the Qumran community had a baptism initiation different from the others because the context of this passage suggests daily ceremonial ablutions for members of the sect. John the Baptist infused in the act of initiation and ritual purification an ethical quality that baptism did not have before.The baptism was instituted by Jesus Christ as a rite of initiation into their religion. Being baptized into Moses 1Corinthians 10:2 means become subject to the law of Moses; be baptized into Christ, means to become a true follower of Jesus. Around the time of the Didache, baptism was comparatively simple. It was preceded by instruction and was given "in the name of the Father, Son and Holy Spirit." It was used tap and cold water, but if there were no available it was used even warm water. 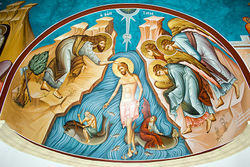 In the absence of sufficient water, the author of the Didache provided baptism by pouring three times in the baptized, "in the name of the Father, Son and Holy Spirit." The story of John the Baptist shapes the way we view baptism. Jesus came to the Jordan River which is seen on the image and asked John to baptize him. He was confused because he believed Jesus should baptize him not the other way around. John was an ordinary man who preached the word of God and baptized many people, but Jesus insisted that it must be done. While Jesus was getting baptized the holy spirit came in the form of a dove to show the peace between God and humans as well as the sacrifice Jesus will make for all our sins. Matthew 3:13-17 gives us an understanding of how this all played out it states “ Then Jesus came from Galaie to the Jordan river to be baptized by John. But John tried to deter him, saying, “I need to be baptized by you, and do you come to me?” Jesus replied, “Let it be so now; it is proper for us to do this to fulfill all righteousness.” Then John consented. As soon as Jesus was baptized, he went up out of the water. At that moment heaven was opened, and he saw the Spirit of God descending like a dove and alighting on him. And a voice from heaven said, “This is my Son, whom I love; with him I am well pleased.” . We know that baptism symbolizes a new beginning with Christ and is significant in our relationship with God. Jesus gets baptized by John to serve as an example for us. ↑ Unger, Merrill F (1988). Harrison, R. K.. ed. The New Unger´s Bible Dictionary. Chicago: Moody Press. p. 142-144. ISBN 0-8024-9037-9. ↑ 2.0 2.1 Douglas, J.D. ; Tenney, Merril C, ed. (1987). The New International Dictionary of the Bible. Grand Rapids, Michigan: Zondervan Publishing House. p. 123. ISBN 0-310-33190-0. ↑ Baptism, What is it? Meaning and Defination "Crosswalk". Web. Nov 20, 2017 (date published.) Author Unknown. ↑ what is baptism “Jehovah's Witnesses” . Web. January 16, 2019 (date accessed). Author Unknown. ↑ Peters, Carl. should we anoint with oil at baptism “Anchor Baptist Church”. Web. July 10, 2012 ( Date of Publication). ↑ is baptism necessary for salvation “Got Question” .Web. Jan 17, 2019 (date accessed). ↑ Lenk, Steve what is the importance of Christian baptism “ Active Christianity”. Web. Jan 17, 2019 (date accessed). ↑ what is the origin of baptism “Got Question” .Web. January 15, 2019 (date accessed) Author Unknown. ↑ Lamadrid, Antonio González (1971) (in Spanish). Los Descubrimientos del Mar Muerto. Madrid: Biblioteca de Autores Cristianos. p. 150-151. ↑ Ladd, George Eldon (1985) (in Portuguese). Teologia do Novo Testamento [A Theology of the New Testament]. Rio de Janeiro: JUERP. p. 39. ↑ Smith, William (1979). Smith´s Bible Dictionary. Nashville: Holman Bible Publishers. p. 32. ISBN 0-87981-033-5. ↑ Latourette, Kenneth Scott (2007). A History of Cristianity:Beginnings to 1500. 1. Peabody, MA: Prince Press. p. 193-196. ISBN 978-1-56563-328-5. ↑ Bueno, Daniel Ruiz (1985) (in Spanish). Padres Apostólicos:Edición Bilingüe Completa. Madrid: La Editorial Catolica - Biblioteca de Autores Cristianos. p. 84. ISBN 84-220-0151-9. ↑ Hopler, Whitney The holy spirit appears as a dove during Christ baptism "thought co" .Web. July 27, 2018 (date of publication). ↑ The baptism of Jesus “bible gateway”. Web. Jan 15, 2019 (date accessed). Author Unknown. This page was last modified on 24 January 2019, at 16:17.